We all want to get the most out of any investment. And when it comes to dentures, their longevity depends on several factors. For example, there are several different types of dentures, made from different materials, with some lasting longer than others. Also, dentures need to be adjusted or relined regularly – and of course, you need to maintain good hygiene and take care of the denture itself. 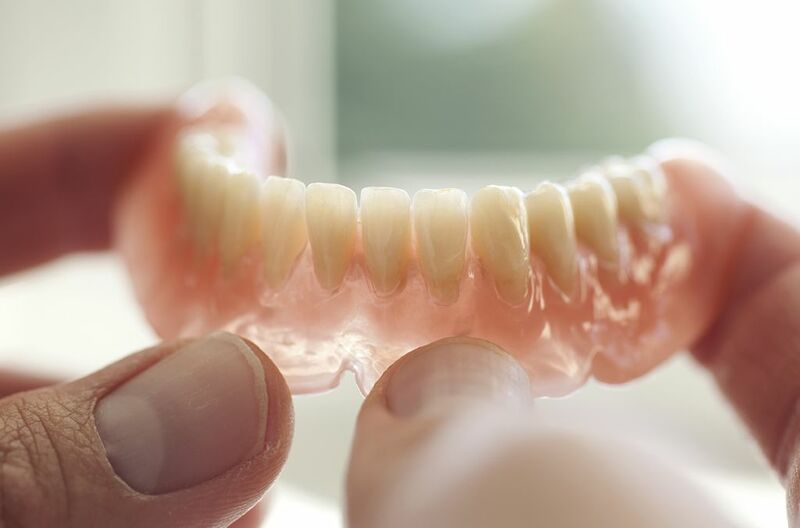 Generally speaking, a denture should last at least three years before it requires relining or maintenance and the denture itself should last from four to six years. These days, there are a variety of dentures on the market, including the new implant supported dentures, which are a game changer for those with missing teeth. With implant supported dentures, the denture is attached to an abutment which is attached to a dental implant placed below the gum line, providing the wearer with a firm, strong base for the implant to attach. Cleaning and maintenance are pretty straightforward; the only downside is that it costs more for implant dentures than regular dentures. Implant supported dentures can last at least 4 to 6 years or more. For those missing just a few teeth, conventional partial dentures are still a good option. As with all dentures, though, these need to be cleaned and maintained, and you will need to see the dentist for examinations and relining. Providing you take care of them, they should last for four to six years. Full dentures are for those missing all teeth and cannot or do not want to make the investment into implant supported dentures. Fortunately, today’s conventional dentures are better than those in the past, with some materials being incredibly lifelike, and you should get four to six years’ wear out of them. Sometimes, you will be given an immediate denture to be worn straight after your teeth have been removed. However, these should ideally be used as an interim measure as they won’t look or feel as comfortable as chrome dentures. Acrylic dentures are also weaker than chrome dentures, so will possibly break or crack – and not last the test of time. The lifespan of your dentures will also depend on how often you wear them. Constant use with lots of chewing will put your denture under more stress. However, as you’d expect, if you only use them occasionally there will be less chance of breakage. And, you’ll still need to have your dentures relined, though. A denture reline is the placement of a new surface on your denture. Relines are necessary because, over time, your mouth and gums change shape. When you no longer have a natural tooth root in your mouth, you start to lose more bone tissue: this is called bone resorption. As your jawbone slowly degrades, the size and shape of your gums change, so over time, a denture that once fit you perfectly will no longer fit. Along with your jaw changing shape, normal wear and tear on the denture will also cause problems with fit. This is why a denture reline is so important. Speak to your dentist about how often you should have your denture relined. Accidents and breakages can also have an effect on longevity, so it pays to learn how to take care of your denture, especially when cleaning it at night. Fortunately, many cracks or chips can be repaired, but if you do damage your denture, call us immediately – don’t try to repair the denture yourself. If you have any questions about your dentures, contact the clinic today. We’re only too happy to help.